Family owned and operated, Mambo Italiano Ristorante is the ideal spot for couples, families and colleagues. With its relaxing atmosphere, the friendliest of staff and most creative daily food specials. 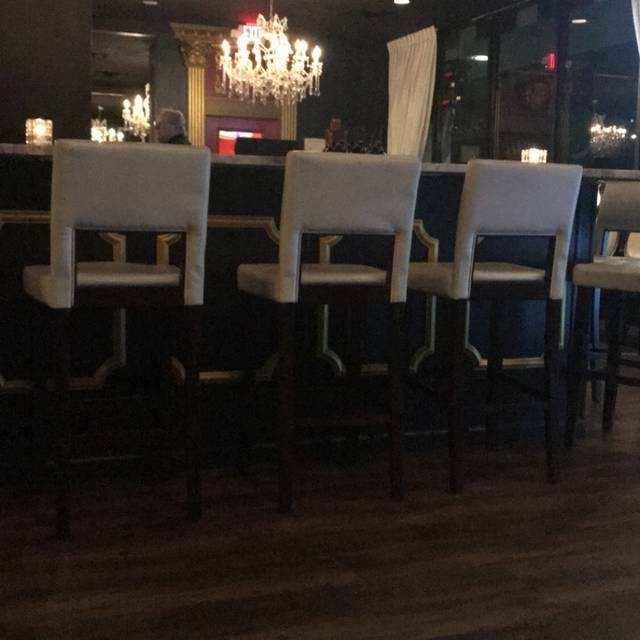 The restaurant's interior is beautifully chic and newly remodeled. Mambo Italiano Ristorante's expert chefs use only the freshest ingredients to prepare the numerous dishes available. With a combination of both traditional and contemporary Italian cooking styles, the menu offers a variety of delicious flavors. Large portions of favorite dishes like veal vesuvio and scallops/asparagus keep customers coming back. Fresh seafood is used to prepare entrees like the seafood risotto, and Mambo Italiano Ristorante's pizzas are made by hand. Dressings: bleu cheese, ranch, thousand island, French, creamy garlic, homemade creamy Italian, homemade balsamic vinaigrette. Add bleu cheese crumbles to any of the below for $1.50. All sandwiches are served with your choice of pasta or fries Add on sweet or hot peppers, on garlic bread or cheese for 0.50 each. Pizza puff stuffed with your choice of ingredients then baked or fried golden brown. So tender they fall off the bone, this Italian sure makes good rib just try em! *Charged as a double ingredient. Food is always good and a good value. Service is exceptional! Always great food and service. Best Italian in area! Excellent service and food. The place smells great as well. Great Italian food. The wait staff is exceptional - we had a wonderful waitress but did notice the servers at the other tables were also friendly and accommodating. The portion sizes allow for leftovers the next day. We had the sausage and peppers appetizer and I can say we have NEVER had that big of a plate of sausage! Besides a complete menu, there are about 8 different specials offered as well. We didn't ask the price of the special that my husband got, but were pleasantly surprised when the bill came. This was our first time at Mambo and we will definitely go back! The food was amazing! From the bruschetta to the banana cheesecake the food and service was outstanding! Highly recommend. My family and I came here for the first time in March and we loved it. We loved it so much we came again for my birthday in April. The food is great, people are friendly and it’s at great price. We discovered it because we were going to Dress up and Dance, also in Mundelein. I LOVE their Veal Vesuvio! The best I’ve ever had! A great homey feeling and always a good meal ! The service is top notch! Fantastic experience. Food, ambiance and service were all beyond expectations. Our first visit there and won’t be our last! Service was great! Food was outstanding! A little hard to find ha but we made it glad we did absolutely will return keep up the great work! We were in town for 3 night. We spent 2 of them here because the food was so good my Italian husband loved it! We just love this place. Too many favorite dishes to mention here! We returned to Mambo after having a not so great experience in September. We were so pleased with our dinner the other night. Everyone enjoyed their meals - and the appetizers we shared (grilled calamari & bruschetta) were excellent. Service was also excellent. I'm glad we gave it another try. This was our second visit to Mambo Italiano and we were just as pleased this time as the first The food is exceptionally delicious and came out the correct temperature. Our service was excellent and food came out timed correctly. We will definitely be returning again and again and we will recommend to all our friends. Thank you for another wonderful dining experience. Always great food and drink. Lots of nightly specials offered. Loved the Braciole-something one doesn’t see often on the menu in a typical Italian restaurant. And the Lobster Cappellacci is a favorite choice of mine! Delicious! Our server Steve was awesome. The food was decent and came out fast. The ambiance was wonderful. You can tell it was recently renovated. For second time food was lackluster. We had a reservation for 7 pm but weren't seated until 7:30 pm which was annoying. The food was great. Food and service were good, but in spite of the fact that the restaurant was nearly empty, we were placed in a booth next to a very noisy party. Next time I’ll speak up! Always lots of good choices at Mambo. Good food, good service, decent price. I'd like to see them tone down the lights in the dining room a bit. Also, with all the great value Italian wine on the market, they'd do good to expand their Italian wine selections and offer them at less than double to introduce others to Italian wines. This is one of our favorite restaurants, it never disappoints us!! Food is consistently good, they have food for every taste in their menu. I thoroughly recommend it. The food was excellent. The service was very warm, friendly and well paced. We were rushed. Our server was quite knowledgeable. VERY DISAPPOINTING. Food was cold and service was terrible! Our friend ordered a side dish and it was wrong. And when we told the waitress...she said "oh...well that goes well with what he ordered.". Very dark atmosphere since they painted the entire interior with black walls. With all the other great restaurants around us, we will not be going back. Also when we express our dissatisfaction with the manager, he really didn't seem to care. Poor customer service. Most of our party had one of the specials and we were not disappointed. Food was excellent from soup to dessert. Our server was knowledgeable and made us feel very welcome. Mambo Italiano always provides a great dining experience. Highly recommend for any occasion. Delicious food .. their eggplant parmigiana is amazing !! Their chicken dishes are good too . We have always had attentive , nice waiters .. the noise level is such that you can carry on a conversation and I think the prices for entree are reasonable . Also have an amazing terramisou . Great food. The stuffed pepper specials should be part of the regular menu...they were delicious! Good food, but crowded, noisy and busy. Service could be improved. Love the high energy and great food. Always a lot of specials. It was really good. Nice waiter and good food. Our first visit here was a nice experience. It was for Valentine's dinner, but we went on 2/15. The food was very good and that goes for the 4-cheese ravioli and shrimp scampi as well as the dinner salad. We ordered a bottle of the local wine and it was more like drinking a port than a red blend. I would order with caution as it is not what you may be expecting for a dinner wine. The server was attentive and other staff made sure water glasses were filled and dirty dishes cleared. Sal and company always provide wonderful, authentic Italian food. Top of our list in the northern suburbs. Food was perfect and server was terrific! Great locally owned restaurant! Only eat at locally owned establishments.